The sun is shining on our recently cleaned solar panels at Downlands, with the two systems regularly getting close to their maximum output when the clouds clear. Now that the panels have been installed for 17 months, we can review the data for a whole year and more, and make comparisons about how this year compares to last year. Our first full year of generation covered the period from April 2015 to March 2016, with total generation in this period being 80,279 kWh. This is very close (99.4%) to the projected figure of 80,731 kWh. 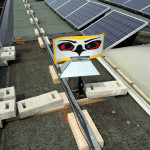 As we have reported previously, the problem of seagulls fouling the panels is of on-going concern, and without this problem we believe the yearly output would have comfortably exceeded the projected figure. This year has seen another significant influence on the performance of the panels – i.e. the distinct lack of sunshine for protracted periods! The effect of this year’s poor weather can be seen in the comparison of the generation in the period March – June in 2016 (37,705 kWh) compared to 2015 (40,881 kWh) – indicating an 8% drop in this year’s output to date. One benefit of the poor weather this year has been that the majority of the panels have been effectively cleaned by the periods of heavy rain. However this has still left us with concerns how best to respond to the heavy seagull fouling in certain areas (the seagulls particularly like some areas on the highest roofs). We’ve been getting mixed messages about how effective the bird deterrent devices (see photo below) are, and we are now into a period of monitoring to allow decisions to be made. To add to the concerns about the seagulls, the deterrent on the sports centre roof was damaged in the gales at Easter and has had to be repaired. Also we decided to move the deterrent on the main school to be nearer the location favoured by the seagulls. In addition we are taking further advice from the supplier of the deterrent devices to help us decide if any further actions need to be taken. As you will know, changes in the feed-in tariff and other government policy changes have made solar more challenging for us, though we haven’t given up on it yet. In the meantime our search for new renewable energy projects in our area has taken us into the area of renewable heat. Renewable heat is a way of heating buildings from renewable sources rather than oil or gas. It’s important in terms of reducing carbon emissions as about a third of our national annual carbon emissions are generated from heating systems. The government provide support via the Renewable Heat Incentive (RHI) scheme, which has not been cut back drastically in the way that support for solar PV generation has. Renewable sources for heat include biomass like wood or special grasses (burned in boilers in much the same way as coal – indeed the Drax power plant in North Yorkshire is in process of converting from coal to biomass), anaerobic digesters (fans of The Archers will be familiar with controversies over these), air source heat pumps, and the source we are investigating, ground source heat pumps. 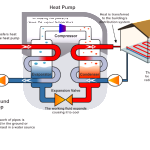 Ground source heat pumps work like a fridge in reverse – through fluid-filled pipes in a continuous ground loop or deep bore holes they take heat from underground which is then used to evaporate the refrigerant fluid in the heat pump (see diagram below). The refrigerant vapour then passes through a compressor that raises its pressure and temperature before passing to the condenser section of the heat pump, where the vapour condenses back to a fluid, giving up its heat to the working fluid used to heat your building. Typically, a well-designed system will produce 4 kWh of heat energy for every 1 kWh of electrical energy used by the heat pump. In many applications there is also a significant potential benefit in being able to run the system in ‘reverse cycle’, allowing buildings to be cooled in hot weather. We are now investigating a ground source heat system that would serve Downlands School and sports centre (powered by electricity – partially at least – from our solar panels), and Windmills School. As a large and complex project it would benefit from a feasibility study. We have just applied for a grant for such a study from the Rural Community Energy Fund, and hope to hear in September whether we have been successful. If we get the grant we will contract with OST Energy in Brighton, an international technical consultancy on renewable energy, to investigate the feasibility in both technical and financial terms of such a project. Part of the feasibility study will be consulting with our community about the plans, to gauge both local support/opposition and also interest in future investment. We’ll let you know about plans for open meetings closer to the time.